Summer and fall in Seattle mean blissfully gorgeous weather and a slew of outdoor festivals for visitors and locals alike. The highlight of summer is Seafair (*June 15–Aug 21; seafair.com), featuring two months of community events, parades, a marathon, and more. During the flagship Seafair Weekend (Aug 5-–7), head over to Lake Washington for hydroplane races, an air show featuring the Blue Angels, and more boating fun. Renting a boat to enjoy the festivities from the water is quintessentially Seattle. For theater lovers, Seattle Outdoor Theater Festival (July 9–10; greenstage.org/seattle-outdoor-theater-festival) offers a weekend of more than a dozen performances—all to be enjoyed while lounging on the grass. And Seattle continues to set the bar in music with annual festivals like Capitol Hill Block Party (July 22–24; capitolhillblockparty.com) and Bumbershoot (*Sept 2–4; bumbershoot.com). Foodies have ample opportunities to indulge in the open air. The city’s fishing tradition gets a delicious salute during Ballard SeafoodFest (July 9–10; seafoodfest.org). Bite of Seattle (July 15–17; biteofseattle.com) brings together the local culinary scene at Seattle Center for the biggest food gathering of the year, and food trucks show up in all their tasty glory at Seattle Street Food Festival (Aug 20–21; seattlestfoodfest.com). On the drinks front, Seattle International Beerfest (July 8–10; seattlebeerfest.com) and Cider Summit Seattle (Sept 9–10; cidersummitnw.com) are a couple of ways to sip your heart out. 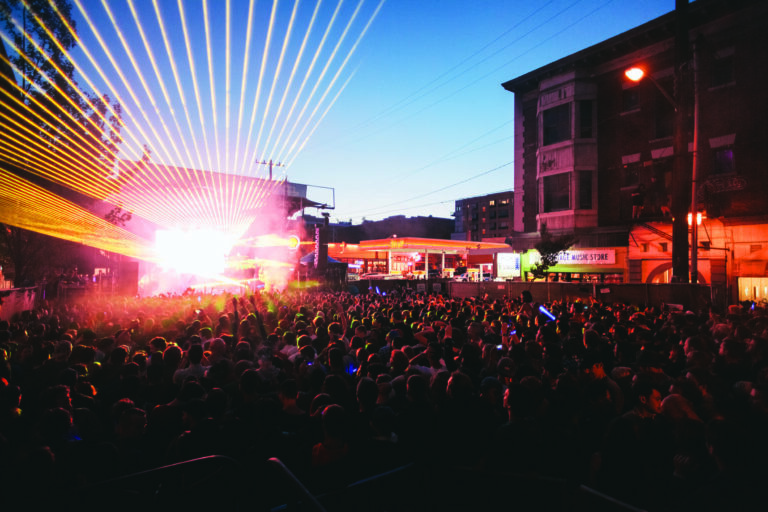 Seattle’s outdoor fests permeate the city’s neighborhoods for a unique way to explore. Fremont Solstice Fair (June 17–19; fremontfair.com) is famous for its parade—featuring bikers in the buff—as well as a plethora of concerts and free-spirited fun. And the Chinatown-International District’s Dragon Fest (July 16–17; cidbia.org/events/dragonfest) provides a colorful mix of Asian dances, martial arts demos, and cuisine.